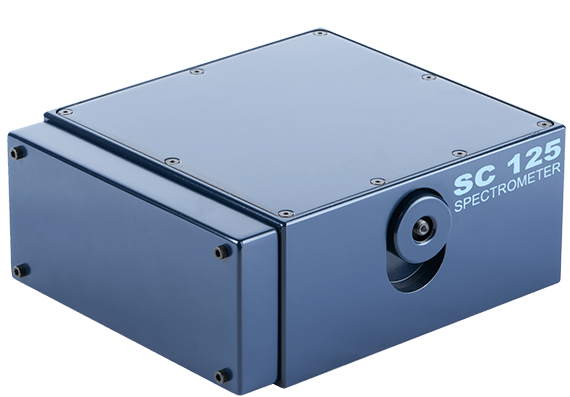 The compact high-sensitivity spectrometer SC125 is developed for low light applications such as measurements of Raman scattering, fluorescence, etc., which require especially high sensitivity or enhanced specifications in the UV spectral range. The high-aperture optical bench of the SC125 has no moving parts and minimises the number of reflective surfaces. The SC125 features a monolithic housing, thus ensuring long-time measurement stability. The case has internal fins – light traps which allow reducing stray light which is a typical problem of compact short-focal length instruments. The SC125 may contain as a detector either one of two non-cooled Hamamatsu back-thinned CCD-arrays without a charge-storage section (back-thinned FFT CCD), operating in the binning mode. 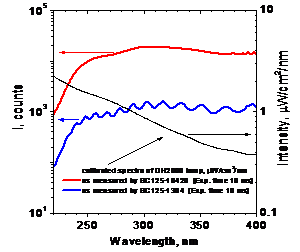 Both arrays have wide spectral range and excellent sensitivity in the UV (see below for the curves of each detector spectral sensitivity and their specifications). These two arrays differ in quantum efficiency, data reading rate, dynamic range, and in pixel active area size. The detector based on the S7030-1006 CCD-array is more sensitive, has lower noise, better values of dynamic range and uniformity. The detector based on the S10420-1106 CCD array is faster, has anti-blooming and, since it has a greater number of pixels and smaller pixel size, ensures better spectral resolution than the S7030-1006. The IMAGING Version (Optional) features an astigmatism compensator – cylindrical lens – installed after the entrance slit. This further enhances of system sensitivity. 1) Signal level – 50% of saturation. 2) Anti-blooming – sensor’s feature eliminating overflow of charges from over-exposed pixels to the neighboring ones. 3)Maximum storage time is deemed to be the time at which dark signal reaches 10% of the dynamic range at the ambient temperature +25°C. At the time of placing your order you should choose a grating lines density (i.e. 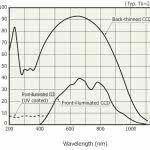 spectral resolution of your instrument), as well as the spectral range for operation. For your convenience the table below lists the average values of grating dispersion, spectral resolution and multichannel array bandpass. 2) for the SC125- S10420 model. 3) for the SC125- S7030 model. 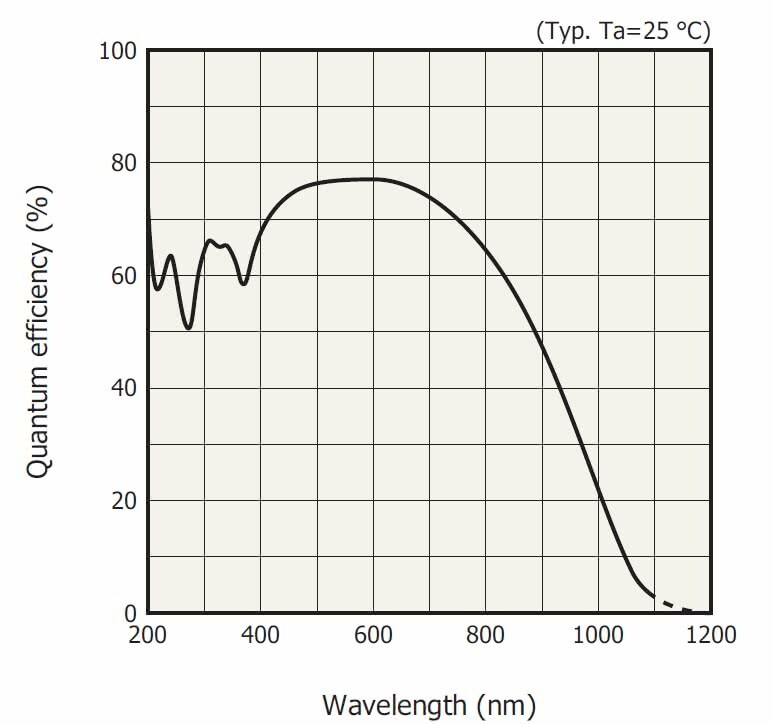 EXAMPLE: If you are interested in the1200 lines/mm grating and the S10420-1106 detector (spectral resolution of 0.25nm), then you should choose the location of 170nm multichannel array bandpass within the possible 180-900nm spectral range of the grating. 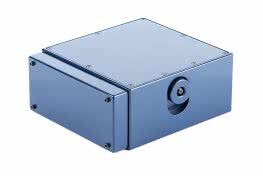 For instance, the SC125- S10420 spectrometer operating in the range of 250-420nm with 0.25nm resolution. 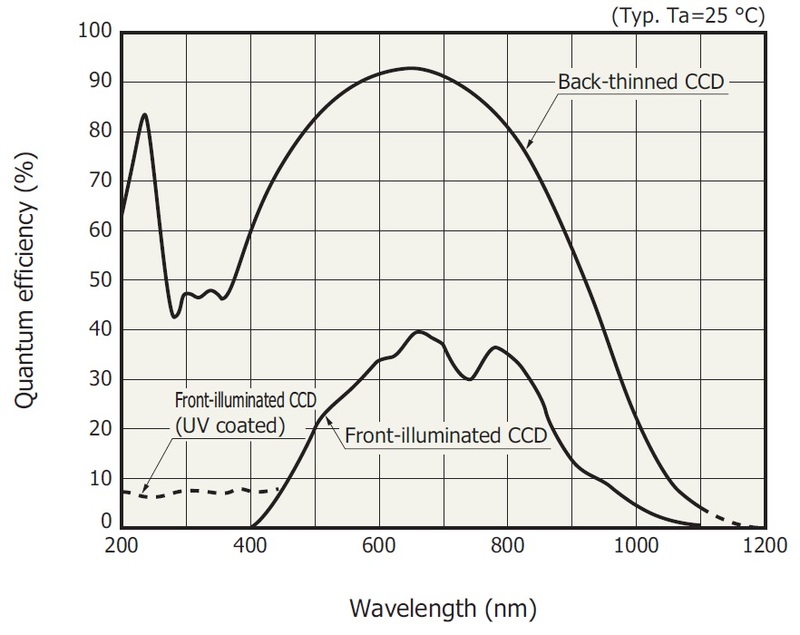 The values indicated in the table are calculated for 300nm wavelength. With increased wavelength, dispersion of a specific grating and multichannel array bandpass are slightly decreased and resolution is improved. 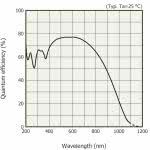 Contact a SOLAR LS specialist for more precise calculation of parameters for your instrument. 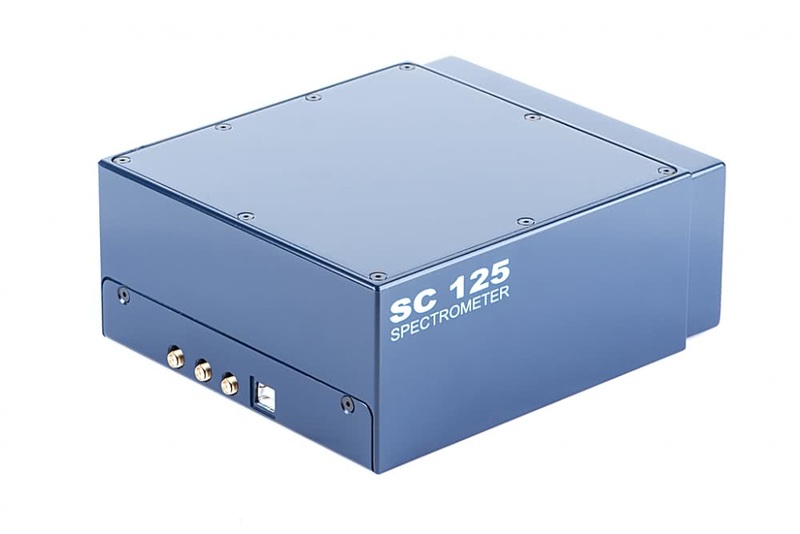 At your request the SC125 spectrometer can be equipped with optional calibration of spectral sensitivity. Calibration is performed with certified light sources (a deuterium lamp for the 220-400nm spectral range and a halogen lamp for the 300-1050nm range). It is made using a fiber input and is valid for 1 year provided that the optical fiber is not removed from the spectrometer. Calibration accuracy is +/-10%. determine the light power density in the UV ranges A, B, and C*. * Features marked with an asterisk are not included into the software of your spectrometer; they are implemented by exporting to external programs. 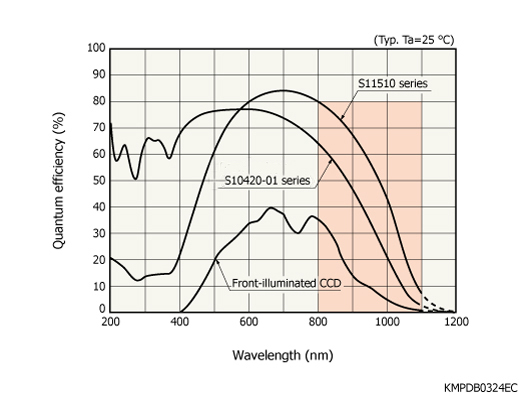 Spectra recorded by the SC125 spectrometers with TCD1304 Toshiba CCD detectors (14 bit) and S10420-1106 Hamamatsu CCD detectors (16 bit), and the reference spectrum of the deuterium lamp emission in the spectral range of 220-400nm are presented in Figure 1. The figure shows that, other things being equal, the S10420-1106 detector provides higher intensity than TCD1304 and the absence of intensity modulations, which can introduce additional distortions into sensitivity calibration. Besides, the S10420-1106 detector features a wider dynamic range (due to its low noise and through the use of 16 bit digitisation instead of 14 bit). 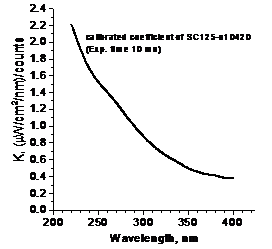 Figure 2 shows the spectral dependence of sensitivity calibration factor of the SC125-S10420 spectrometer in the range of 220-400nm. Increase of the calibration factor with decreasing wavelength is resulting from decrease of the detector sensitivity and reflective index of mirrors, along with the increase of photon energy. Multiplying the measured spectrum of your source by the spectrum of calibration factor (this is done automatically by the software) you will get the true undistorted spectrum. Dependence of the signal acquired with the SC125-S10420 on intensity of the signal from the calibrated source (Figure 3) proves excellent linearity of the S10420 detector (as opposed to the TCD1304, which shows considerable nonlinearities at the edges of its dynamic range, i.e. at high and low signal levels). Good detector linearity provides a possibility to calibrate the spectrometer sensitivity for one exposure time, and then to use this calibration for other exposure intervals. A detector based on the S7030-1006 Hamamatsu array has advantages similar to the S10420-1106 detector. 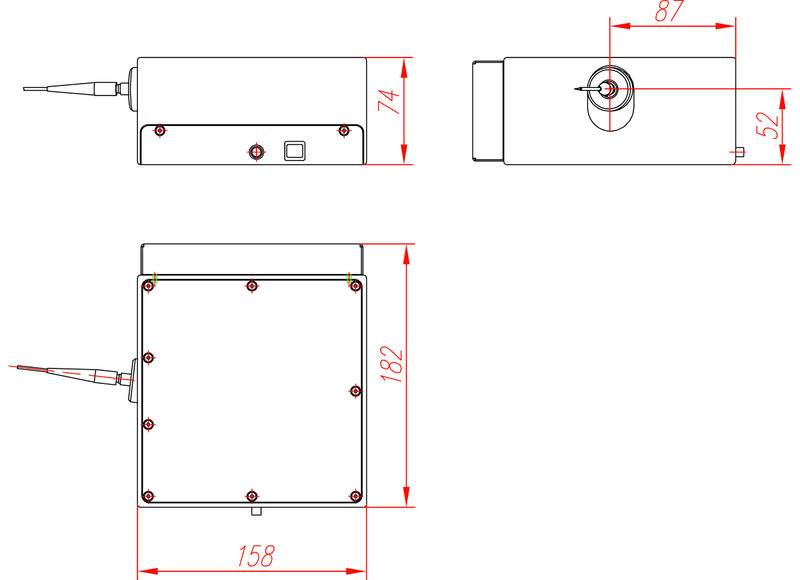 Due to the above mentioned properties we recommend both of these detectors for use in spectral instruments with the sensitivity calibration option. Starting from mid-2014 we intend to perform sensitivity calibration of spectral instruments in the UV and visible spectral range with issuing certificates of calibration which will be recognised in the territory of CIS and Europe. Calibration will be made on the basis of an accredited calibration laboratory of the Institute of Physics of the Belarusian National Academy of Science with reference to national standards of Belarus, Russia and Germany. 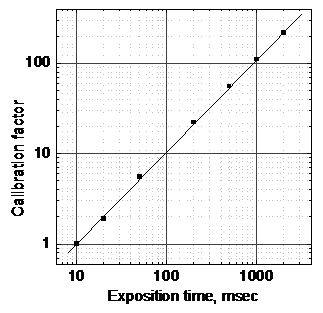 Calibration accuracy will depend on a chosen spectral range. The emission will be input into a certified spectrometer via an optical integrating sphere (the scheme is shown in Figure 4), being the most proper approach in terms of minimising measurement errors. It should be noted however that sensitivity of the spectral instrument is greatly reduced (102-104 times). To calculate the operating spectral range and resolution, select the diffraction grating, detector type and entrance slit width. Then select the location of the multichannel array bandpass within the possible spectral range of the diffraction grating. Diffraction grating The choice of the grating with a large number of lines/mm will lead to a better expected resolution and a narrower multichannel array bandpass. Blaze wavelength affects grating efficiency. It is selected at the time of the spectrometer order. Select the location of the multichannel array bandpass within the possible spectral range of the diffraction grating. Move left and right handles to select start and end wavelengths (or drag the whole range) with left-mouse button. Binning mode and 2D-imaging mode without sensitivity calibration.